A couple, John and Lara, live a nightmarish existence when the wife is jailed for allegedly killing a co-worker and her college-lecturer husband is left to raise their son and manage his wife's appeals. 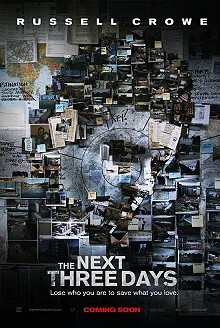 The Next Three Days, from writer-director Paul Haggis, is a one-man caper film. After a rejected appeal, a husband, a Mr Average (Russell Crowe), has three days before his wife is transferred out of the Pittsburgh country jail and into long-term incarceration. Seeing no further options, he decides to break his wife out of prison. Convinced of his wife's innocence, John lives a life of quiet desperation. Once he decides on his course of action, his life becomes centred on the need for money and information about prison routines. This is not a quick, slick, musically-underwritten tale, but one that drags its feet in an effort to show how much work John puts into seeking his wife's release. The result is a fairly interesting tale in search of a good, ruthless editor.